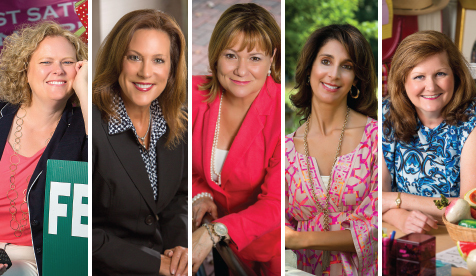 Focused, hard-working and generous: Meet the 2013 Women of Western Wake. Some are familiar faces about town, while others may be new to you. Either way, we’re grateful to these five women for their willingness to share their “keeping it real” stories in an effort to encourage and inspire us all. 59% of women in NC are active in the workforce. 66% of women in NC with children under the age of five are active in the workforce. 27% of women in NC have a bachelor’s degree or higher. 28% of businesses in NC are owned by women, 17th highest in the nation. $9,185 average annual fees for full-time infant child care in a center, $7,774 for a 4-year-old. $5,685 average annual tuition and fees for a public 4-year-college in NC. $33,000 median annual earnings for women who work full-time, year-round in NC. 13% povery rate for women 18 and older in the Raleigh metro-area. Lower than Charlotte, Asheville, Greensboro and Fayetteville. Powerful, influential and driven. These are characteristics of a leader, and describe our picks for this year’s Women of Western Wake. With their power, influence and drive, they have changed the dynamic of the local, national and international business community and enriched the lives of local citizens. All of them create these changes while they wear many hats as wives, mothers, executives, chairs, volunteers and friends. They cultivate the landscape of their work environments into factories of success, and focus on raising the next generation of leaders in their home environments. And they do it with class, charisma and sophistication. 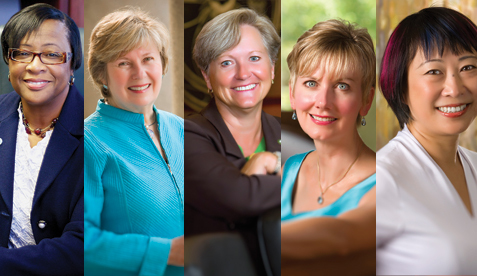 In the following pages, Cary Magazine highlights this year’s five female role models: Cynthia Marshall, president of AT&T North Carolina; Gale Adcock, director of Corporate Health Services for SAS Institute; Virginia Anthony, president of the Kirk of Kildaire Presbyterian congregation; Maureen Hartford, president of Meredith College; and Ping Fu, chief executive officer of software firm Geomagic.